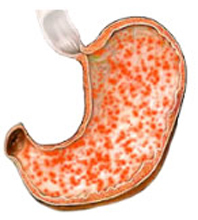 Pangastritis is defined as the inflammation of entire lining of the stomach. The inflammation of gastritis is most often seen as the result of infection with the same bacterium that causes stomach ulcers. Pangastritis can occur suddenly known as acute gastritis or appear slowly over time known as chronic gastritis. When we eat food, it goes down through the food pipe and it is stored in stomach for about 1.5-2 hours. In the stomach, food undergoes disintegration into small particles. HCl (Hydrochloric Acid) kills the micro-organisms present in the food. The small portion of the food is absorbed. After 1.5-2 hours, the food is pushed down to intestine for further digestion. If the inner lining of the stomach is irritated or damaged or inflamed, this condition is known as gastritis. The stomach lining can become inflamed due to certain reasons like heavy alcohol consumption, eating spicy and junk food, stress etc. WHAT ARE THE SYMPTOMS OF PANGASTRITIS? Feeling of fullness in the upper abdomen after eating. WHAT ARE THE CAUSES OF PANGASTRITIS? In erosive gastritis drugs, alcohol, acute stress and infection can precipitate the condition. In most non-erosive gastritis conditions, H.pylori often found in people who suffer from no significant symptoms of gastritis. The symptoms appear when the gut becomes a conducive environment for H.pylori to colonise. According to Ayurvedic concept, the inbuild of toxins and impurities, blockage of proper circulation in the gut creates ground for mucosal irritation from both the toxins and H.pylori growth. According to Ayurveda, root causes of Pangastritis are poor eating habits, taking incompatible food, intake of spicy and fried foods. Due to these foods, food is not digested properly and it provokes the excess of acidic secretion and thus results in gastric irritation. According to Ayurveda, this disease is of Pitta origin so all measures are undertaken to pacify Pitta, therefore medicament should subside the irritation. After once complete remission of the complaints, elixirs are prescribed so as to check the re-manifestation of the similar conditions in coming days. Achieving overall balanced function of stomach. Regular chewing of half a teaspoon of fennel seeds after food helps in relieving burning sensation in the stomach. Half glass buttermilk added with a pinch of asafoetida, half teaspoon of fenugreek seeds can be taken with food. Crush cumin seeds into a fine powder. Add half a teaspoon of cumin seeds to 1 litre of water and boil the water for 2 minutes and then filter it. Drink this water regularly in place of normal water. But, prepare fresh water daily. This is a natural remedy for pangastritis. 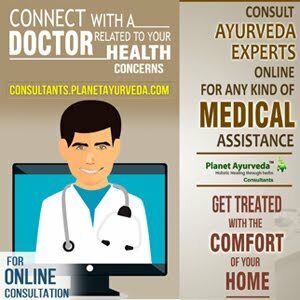 Digestion Support of Planet Ayurveda is a blend of unique herbs which are described in Ayurveda as the best digestive herbs. These herbs help in maintaining the normal pH level and aid in digestion. According to Ayurveda, complex digestion problems are the root cause of almost all the diseases because improper digestion does not lead to proper assimilation of nutrients in the body. 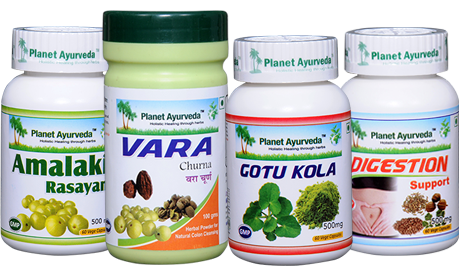 Vara Churna by Planet Ayurveda is a blend of most popular Ayurvedic herbs like: Haritaki, Bhibhitaki and Amalaki. The herbs used in this combination are useful in multiple problems as they remove the accumulated toxins in the body. It is a best herbal remedy for constipation and can effectively cleanse the colon. The above formula can be used for constipation without habit formation. Dosage: One teaspoon of vara churna can be taken with lukewarm water, after meal, twice. Amalki Rasayan is prepared with Amalki under a process (Indian gooseberry) which has anti-inflammatory properties and help to provide relief in abdominal pain associated with chronic gastritis. This product is available in the form of capsules and are free from any colours, preservatives and chemicals. It is prepared from the pure extract of herb Amalki (Emblica officinalis). Gotukola Capsules of Planet Ayurveda are prepared by the pure extract of herb Centalla asiatica. This plant has a great medicinal importance in Ayurveda. This herb helps in pacifying Vata and Pitta doshas thus provide a great relief in chronic gastritis, abdominal pain, lack of appetite, nausea, vomiting, indigestion etc. Avoid sour, salty and spicy foods. Drink at least 8-9 glasses of water everyday as water helps in clearing the accumulated toxins from the body. Stay away from carbonated beverages, tea, coffee and alcohol. Patients suffering from gastritis should fast for one or two days. Regular walking for 30-45 minutes can provide relief. Include fruits such as pomegranate, bananas, apples, grapes, coconut water, asafoetida, cumin seeds (jeera), coriander and amla (indian gooseberry) in the diet. Include herbs like ginger, ajwain in the diet. Take small quantity of ghee (clarified butter) in the diet as ghee calms Pitta and improves digestion. Have food at fixed intervals of time as this helps the biological clock of the system to release gastric juice and enzymes at the right time. Must say very interesting and effective remedies. I'm sure many peoples get very beneficial contents from your blogs. Well done.